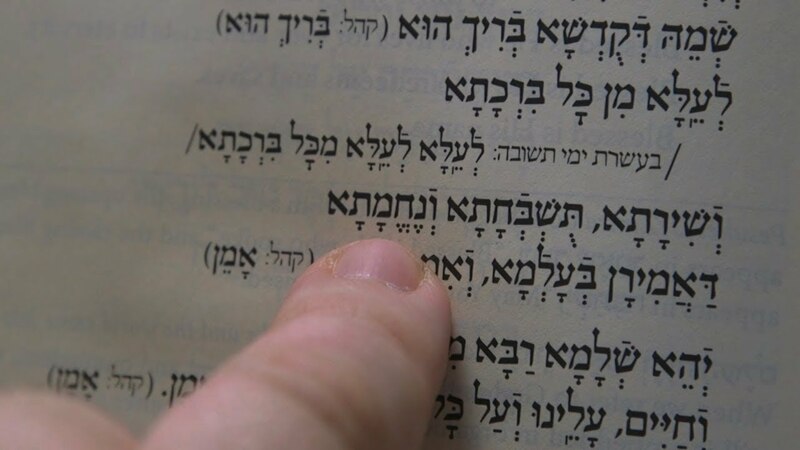 Written in Aramaic, the Mourner’s Kaddish is an almost 2,000-year-old prayer traditionally recited in memory of the dead. The prayer, which is included in all three daily prayer services and is recited in a minyan of at least 10 adult Jews, makes no mention of death. Instead, it is a prayer dedicated to praising God. Find the text in Aramaic, transliteration and English translation here. For whom does one say the Kaddish? How frequently do Jewish mourners recite the Kaddish? For how long does a mourner say the Kaddish? When did Jews begin reciting the Kaddish? Why was this prayer designated by Jewish law to memorialize the dead? Can women say the Kaddish? Is there any reason to say the Kaddish if one is not religious? Are there any alternative rituals for people who are unable to make it to services to say Kaddish? What is it like to say Kaddish? Traditionally, Jewish men are required to recite the Kaddish for a deceased parent, spouse, sibling or child. However, many women recite the Kaddish as well, and it is also permissible to do so for loved ones who are not parents, spouses, siblings or children. Traditionally Jews recite Kaddish three times a day at the daily morning, afternoon and evening prayer services. However, Jews who say Kaddish have a range of practices — some people go to services daily to recite Kaddish, while others do so only on Shabbat. In some Reform congregations, the Kaddish is said even when a minyan is not present. Traditionally, Jews are required to say the Kaddish for 30 days after burial for a child, spouse or sibling, and for 11 months after burial for a parent. From then on, one recites Kaddish on a loved one’s yahrzeit (the Hebrew anniversary of their death) and at Yizkor (memorial) services. This tradition dates back to the Talmud. The prayer was written in Aramaic, because it was the vernacular — the language spoken by most Jews at the time. In Nihum Aveilim: A Guide for the Comforter, Rabbi Stuart Kelman and Dan Fendel write that the prayer originally had nothing to do with mourning. Instead, it “was originally a call for the coming of God’s ultimate reign on earth” and was often said following a study session or sermon, and came to be known as the Rabbi’s Kaddish. The Mourner’s Kaddish was originally known as the Orphan’s Kaddish and was said only by children for their parents, but now encompasses other mourners. There are also other forms of the Kaddish used in the daily prayers as well as a at funerals. Since Judaism focuses on life, the tradition often sees death as a lessening of God’s presence in the world. The Kaddish prayer, which focuses on increasing God’s grandeur in the world, is meant to counteract that. Outside of Orthodox Judaism, the answer is yes. In the Orthodox world, the issue is more complicated, with some communities supportive of women reciting the Kaddish and others objecting to it. Learn more about women and Kaddish here. Telushkin notes that reciting the Kaddish is psychologically beneficial because it gets mourners to go out in public and join a community. “After the death of a loved one, a person might well wish to stay home alone, or with a few family members, and brood. But saying Kaddish forces a mourner to join with others,” he writes. Saying Kaddish also can provide much-needed routine and structure in a life that has been upended by loss, and participating in a ritual Jews have been practicing for centuries gives one a feeling of being part of something larger. Rabbi Hauptman suggests reading a chapter from the Torah or the Prophets or studying a passage from the Mishnah or Talmud. Some people also find Jewish meditation helpful during the mourning period.